Special zucchini bread with ginger sesame topping, adapted from 101 Cookbooks won second place in the tasting competition. The "special ingredient" has the tasting panel scratching their heads, and then exclaiming in wonder. This year, one of our seed suppliers, Johnny's, sent out the wrong seeds to everyone who ordered Costata Romanesca squash. 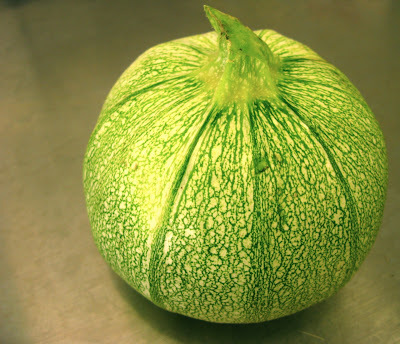 In fact, the lovely round squash isn't a Costata at all, but something else: still delicious and prolific, but rounder and slightly wetter than what we bargained for. Turns out the mystery squash is perfect for zucchini bread. The seeds inside (even a larger one) aren't too big, so I just chopped off the stem, cut the squash in wedges, and used a food processor to shred it all. 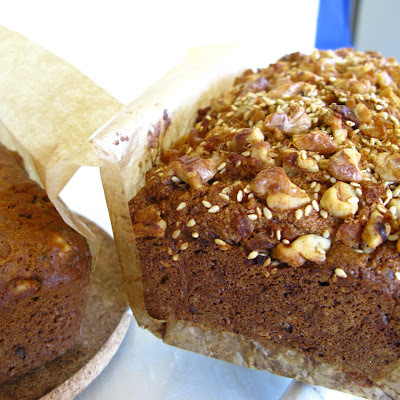 I tested three recipes, a traditional sweetish walnut-cinnamon-nutmeg loaf, a slightly zany nutty loaf with a secret ingredient, adapted from 101 cookbooks and a savory zucchini-basil muffin recipe, adapted from a message board post on a Chowhound message board. 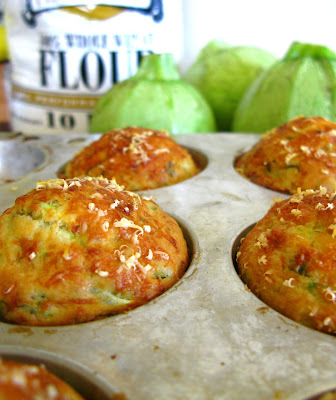 The tasting panel generally agreed that the zucchini basil muffins won out, with the zany recipe not far behind. The more traditional recipe turned out too dry and slightly over-sweet. It could have done with some soaked raisins and extra zucchini. Since I was making three recipes, I cut all the batches in half, and the resulting recipes are what came of those adjustments, plus my own small customizations. I added extra basil to the muffins, because it's tough to overdo it with fresh basil; I changed the ingredients slightly on the "Special Zucchini Bread" to include sesame seeds and ground ginger, and reserved half of the mix'ns to sprinkle on the top for crunch. When I halved a recipe that called for 3 eggs, I used a peewee egg, plus a regular egg, but a yolk would do just fine. Adapted from the LA Times by way of Chowhound. Beat egg in bowl, stir in milk and oil, then mix in sugar. Sprinkle baking powder and salt evenly on top. Mix in flour until just moistened, then gently mix in zucchini and basil. Fill a well-buttered muffin tin so that the cups are nearly full (slightly more than 3/4). Sprinkle with cheese. Bake at 450 degrees, 20-25 minutes. Makes 6-9 muffins. You can easily double for a bigger batch. Preheat your oven to 350°F. Butter one 5x9 loaf pan, dust it with a bit of flour and set aside. In a small bowl combine the walnuts, sesame seeds, lemon zest, and gingers. Set aside. In a mixer, beat the butter until fluffy. Add the sugars and beat again until mixture comes together and is no longer. Add the eggs, mixing well and scraping down the sides of the bowl between each addition. 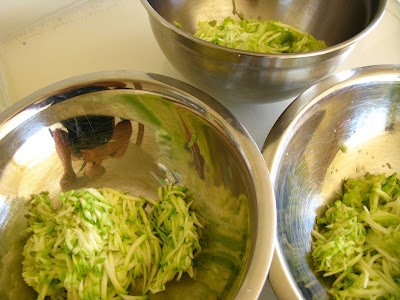 Stir in the vanilla and then the zucchini (low speed if you are using a mixer). Sprinkle the baking soda on top of the mixture. Then sprinkle on the salt and curry powder as evenly as possible. Add the flour in 1/2 cup at a time, stirring until just incorporated each time. 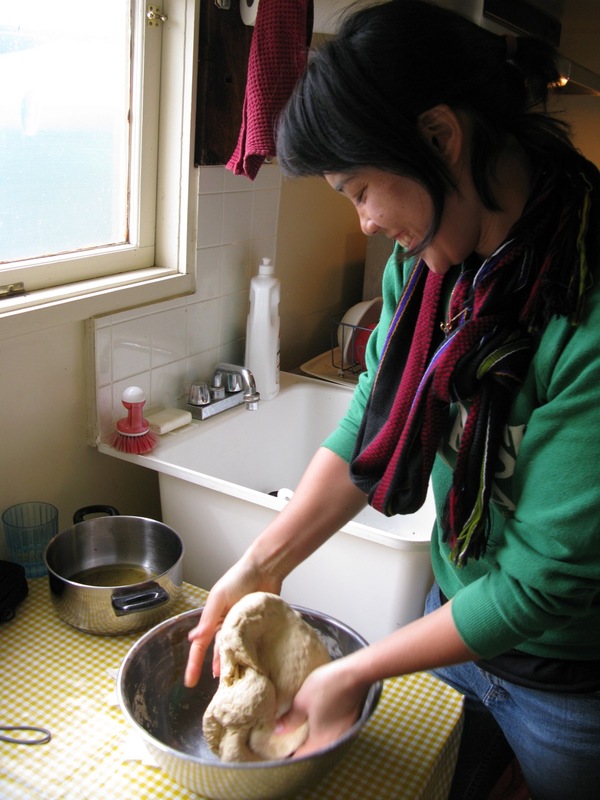 After the last batch of flour, fold in half of the walnut, sesame, ginger mixture. Put the batter in the greased pan, making sure it is level with a spatula or the back of a spoon. Then sprinkle on the other half of the walnut, ginger, lemon mixture. Bake for about 40-45 minutes on a middle oven rack. Check the bread after 35 minutes and cover if it begins to brown too quickly. The loaf will be done when an inserted toothpick comes out clean. Take the loaf out from the oven and let cool for about ten minutes, then remove from the pan onto wire racks to finish cooling. Makes one loaf. To double, use 3 eggs instead of 1 egg + one yolk. YUM! I saved your recipes for this weekend, cause we have zillion and zillions of zucchini and need lots of thing to make with them. I actually made a chocolate zucchini cake this last week and oh momma! was it good. I will be posting it some time this week. BTW the mystery zuc is called "roly poly" cute huh? Oh and they are terrific stuffed. Hooray! Let me know how it turns out. The muffins really are yum yum, and SO easy to make. Thanks so much for the tip on the name of the zuc! Are you sure the muffins need to be cooked at 450 and not 350? I just made them and they were crisp on the outside and almost runny on the inside. Maybe my stove is weird though? They and the bread both taste great though. Thanks for sharing your recipe. 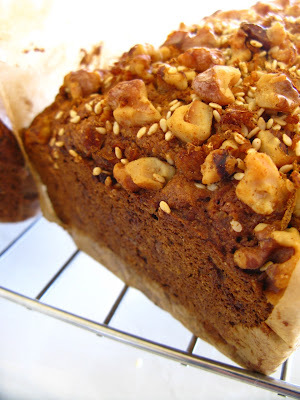 I just googled Zucchini bread and ginger and it came to you!